Roundup is the brand name of a systemic, broad-spectrum glyphosate-based herbicide originally produced by the U.S. company Monsanto, which was acquired by Bayer in 2018, and contains the active ingredient glyphosate. 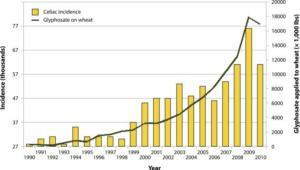 Glyphosate is the most widely used herbicide in the USA. Monsanto also produced seeds which grow into plants genetically engineered to be tolerant to glyphosate, which are known as Roundup Ready crops. 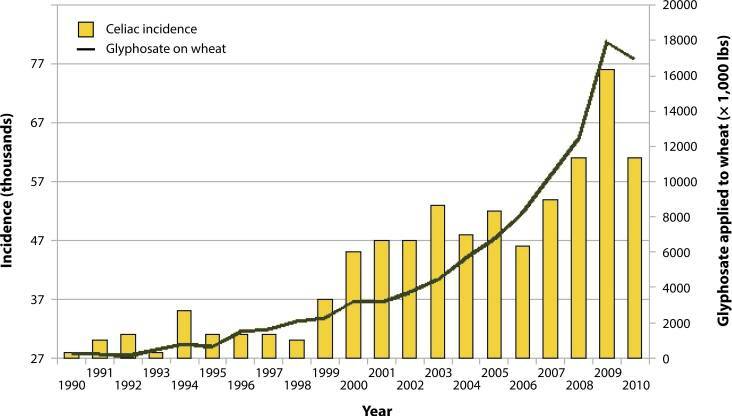 According to a paper published in 2013 Glyphosate, the active ingredient in the herbicide Roundup®, is the most important causal factor for Coeliac disease, and, more generally, gluten intolerance. Coeliac disease is associated with an increased risk for non-Hodgkin lymphoma. Another paper from the same year described glyphosate as potentially a key contributor to the obesity and autism epidemic in the United States, as well as to several other diseases and conditions, such as Alzheimer's disease, Parkinson's disease, infertility, depression, and cancer. Glyphosate has been shown to disrupt gut bacteria in animals, preferentially killing beneficial forms and causing an overgrowth of pathogens. Coeliac disease is associated with a reduced presence in the gut of commensal [healthy] bacteria such as Lactobacilli and Bifidobacteria, which are known to be preferentially killed by glyphosate, and with an overabundance of C. difficile, which is known to be promoted by glyphosate exposure. 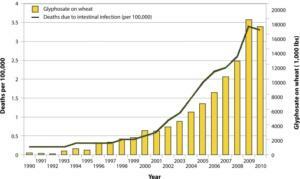 Glyphosate leads to chelation [binding] of minerals such as iron - which might be causative to widespread iron deficiency. It has further been found to decrease the activity of the digestive enzymes protease [for protein digestion], lipase [for fat digestion], and amylase [for starch digestion] in the gastrointestinal tract. Evidence from this effect suggests that glyphosate may interfere with the breakdown of complex proteins in the human stomach, leaving larger fragments of wheat in the human gut that will then trigger an autoimmune response. Glyphosate is associated with an overgrowth of pathogens along with an inflammatory bowel disease in animal models. • Belgium: In 2017, the Flemish government banned individual use of glyphosate and voted against re-licensing glyphosate in the EU. The country was one of six EU member states to sign a letter to the EU Commission calling for "an exit plan for glyphosate." • Bermuda: The island outlawed the private and commercial sale of all glyphosate-based herbicides. • Colombia: In 2015, the country forbid the use of glyphosate to eliminate illegal plantations of coca, often used to make cocaine, due to concern that the herbicide causes cancer. However in 2017, the country re-instituted its controversial fumigation program. But instead of using aerial fumigation, glyphosate is now sprayed manually, from the ground. • Netherlands: Dutch officials have banned all non-commercial use of glyphosate. • Sri Lanka: In 2014, Sri Lankan President Mahinda Rajapaksa mandated an all-out ban on glyphosate, following a study linking Roundup to Fatal Chronic Kidney Disease (CKD), the second-leading cause of death among males in the country. Sri Lanka was the first country to issue a nationwide ban on glyphosate. • El Salvador: Passed a law banning glyphosate, citing the same study linking fatal chronic kidney disease to Roundup. • Middle Eastern countries, including Saudi Arabia, Kuwait, Qatar, Bahrain, Oman and the United Arab Emirates, have stopped glyphosate use. • France: President Emmanuel Macron announced in November 2017, an outright ban on glyphosate, to take effect "within three years." 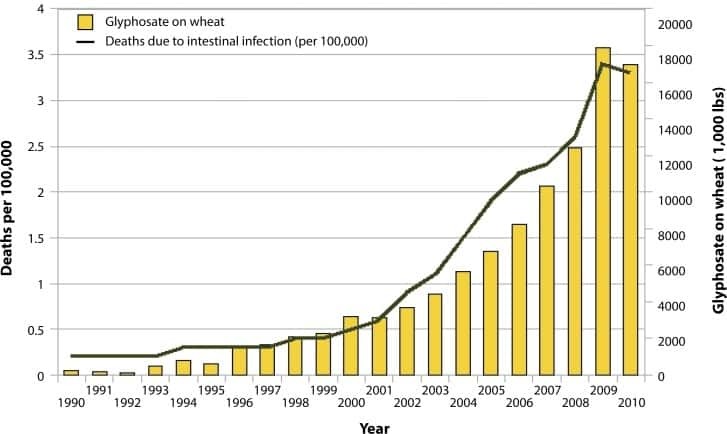 Samsel A, Seneff S. Glyphosate, pathways to modern diseases II: Celiac sprue and gluten intolerance. Interdiscip Toxicol. 2013;6(4):159-84. Samsel A, Seneff S. Glyphosate's suppression of cytochrome P450 enzymes and amino acid biosynthesis by the gut microbiome: Pathways to modern diseases. Entropy. 2013;15:1416–1463. Risk of non-Hodgkin lymphoma in celiac disease. Catassi C, Fabiani E, Corrao G, Barbato M, De Renzo A, Carella AM, Gabrielli A, Leoni P, Carroccio A, Baldassarre M, Bertolani P, Caramaschi P, Sozzi M, Guariso G, Volta U, Corazza GR; Italian Working Group on Coeliac Disease and Non-Hodgkin's-Lymphoma. JAMA. 2002 Mar 20;287(11):1413-9.